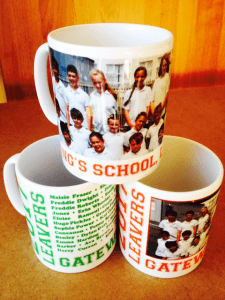 School Leavers Mugs are an excellent choice of leaving gift for year 6 leavers. As you would expect our school leavers mugs (like all our products) are made from the highest quality materials. They are all dishwasher and microwave safe and printed in full colour to your exact requirements. We have set out below just a few example designs but we would work with you to tailor your design to your needs, so don’t feel constrained by the design ideas set out below. All of our school leavers mugs come INDIVIDUALLY packaged inside a solidly made cardboard presentation box. Make sure you check with other suppliers how their mugs are delivered as many will come without any individual packaging which will make getting them home to parents safely very fraught. We have set out here some example mug designs (click for a bigger image), but when it comes to placing an order with us we tailor every leavers mug design to your school colours, name and (if applicable) photography completely free of charge. We work with you until you are 100% happy with the design and approve it for printing. As you can see some of our mug designs include photographs and other list of the students leaving in that year. We will work with you and the available photography/information to create a school leavers mug as unique as your children are. All prices quoted above include VAT, setup and delivery. No hidden charges! Mugs will be delivered in under two weeks from the date of order. The prices above include delivery by our courier DPD to any UK mainland address.